Wild animals are being poached on a massive scale, with millions of individual animals of numerous species worldwide killed or captured from their native habitats. And the number is increasing. At recent, a father and his son were captured on a hidden camera while shooting a defenceless bear and her cubs. The illegal killing reportedly was captured in the Gulf of Alaska, triggering debates over animal poaching across the globe. The viral video was released on YouTube this week, two months after the duo were sentenced for the act. This incident was reported a few days after a video of a man hunting a sleeping lion was released on social media. 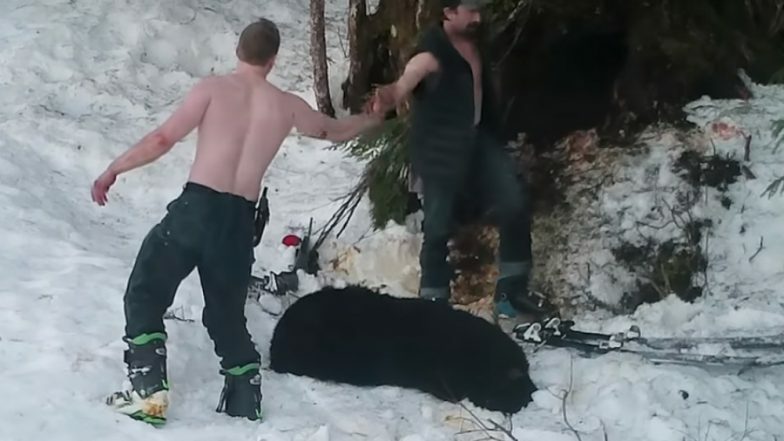 According to various media outlets, the footage was filmed in April, 2018 and was recently released by the Alaska Department of Public Safety following a public records request by the Humane Society. The short clip shows father Andrew Renner and son Owen Renner, skiing up to a den on an island in Prince William Sound. The father can be seen aiming his rifle inside the den before firing "at least two shots" at the bear inside. "Seconds after the fatal gunshots, cubs began shrieking in the den," the department was quoted saying in a public statement. US Trophy Hunter Pays Pakistan Rs 77 Lakh to Kill Rare Himalayan Goat Markhor. The father then fires several shots, "at point-blank range," killing the newborn cubs. They are seen high-fiving each other, after the brutal act. Owen Renner even poses for a photo shirtless with the mother bear's dead body. Killing bear cubs or a mother with her cubs is illegal in Alaska; which presumably both the men were unaware of. The pair were unaware that they were filmed by the US Forest Service and the Alaska Department of Fish and Game, who placed the hidden camera for conducting a study. Two days later, the pair reached the spot to collect shell casings and the bodies of the cubs. Blake Fischer Boasts About Killing Family of Baboons, Asked to Resign for Trophy Hunting Pics From Africa. In January, 2019, the father and son were brought to the court and sentenced for killing the bears and also tampering with evidence, contributing to the delinquency of a minor and second-degree falsification; as stated by media reports. The authorities also added that Andrew falsified documentation about shooting the bear, when it was his son who opened the fire. Andrew was sentenced to five months in jail with two months suspension. Besides, he was ordered to pay a fine of USD 20,000 with USD 11,000 suspended, forfeit his 22' Sea Sport ocean boat and trailer, 2012 GMC Sierra pickup truck, two rifles, two handguns, two iPhones, and two sets of backcountry skis which were used in the offences. His hunting license was also revoked for ten years. On the other hand, Owen was sentenced to suspended jail time, community works service and required to take a hunter's safety course. Reportedly, his hunting license was suspended for two years.